Cafe Mangal in Wellesley, Massachusetts is one of the very few restaurants where I eat healthy. I should probably feel worse about saying this, but health isn’t really my thing. Faced with a choice between a green salad versus a hamburger with bacon, peanut butter, and fried bananas, nutrition isn’t a factor and I go Elvis. For that matter, I rarely eat salads. Ninety-nine percent of all vegetables in my diet occur as a complimentary component to some dish’s protein centerpiece. But for whatever reason, Cafe Mangal is different for me. Wednesday, March 21, 2012. My first visit to Cafe Mangal was a Murphy’s Law day. Everything that could go wrong, was. The only saving grace was an afternoon respite between my morning classes and my much, much longer evening class, so I drove forty minutes to Cafe Mangal and met up with my boyfriend (whose day was going about the same). Cafe Mangal in Wellesley, Massachusetts. Café Mangal is surprising narrow on the inside. Just inside the front entrance, the wall is decorated by an impressive collection of awards including Best of Boston and WickedLocal Reader’s Choice. The dining area spreads backward from there narrowly toward the service counter. During the lunchtime rush the place can get crowded, but I’ve never had trouble finding a table amongst Wellesley’s many Ladies Who Lunch. Cafe Mangal’s menu is Mediterrean-American with Turkish influences. 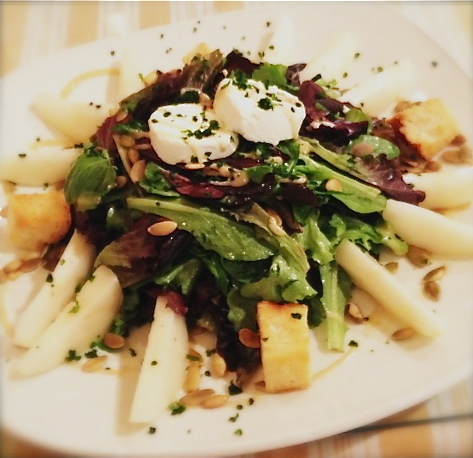 I sought to redeem my day by ordering the pear-and-goat cheese salad with mesclun mix, pears, goat cheese, and toasted pumpkin seeds with honey mustard and house vinaigrette dressing. The photo below was actually my first attempt at food photography. (I like to think that I have improved since then!) I also wasn’t taking notes back then, but I remember enjoying the salad a lot. I had been told about Cafe Mangal by a trusted foodie friend, and I was glad I had taken her word. Pear-and-goat cheese salad with mesclun mix, pear slices, goat cheese, and toasted pumpkin seeds, with a honey mustard and house vinaigrette. This was my first deliberate attempt at food photography. Friday, August 24, 2012. My boyfriend kicked off our second visit to Cafe Mangal by ordering the chicken noodle soup, which was that day’s soup special. The soup was more vegetables than chicken; my boyfriend prefers the other way around, but to each his own. He likes to tell a story about one of his favorite sub shops that used to serve chicken soup for two or three dollars a bowl, brimming with chicken beyond the point where the owner could have made any kind of profit. It should be also noted that maybe from superstition, my boyfriend invariably orders chicken noodle soup if he’s feeling under the weather. Not chicken rice soup, not tomato, not minestrone, but always chicken noodle. 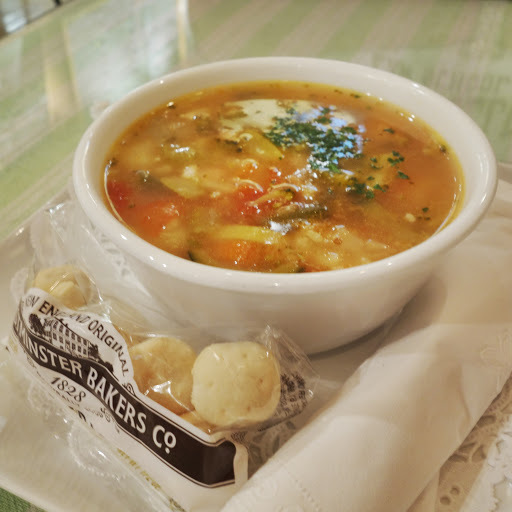 Cafe Mangal’s chicken noodle soup. Every time we’ve been to Cafe Mangal, aforementioned boyfriend has ordered the same sandwich: a white-meat chicken-breast sandwich with tomatoes, lettuce, and parsley on a multigrain roll, sans honey-mustard vinaigrette. Obviously he enjoys it, or he wouldn’t continue to order it. White-meat chicken breast sandwich with tomatoes, lettuce, and parsley on a multigrain roll, sans honey-mustard vinaigrette. I decided to order the smoked salmon salad on this visit. The foodie friend who originally tipped me off about Cafe Mangal in the first place had raved about this, so I figured I should try it. Bear in mind this was my first smoked salmon salad anywhere, ever, so I don’t have a broad palette of comparison. But I thought this was great. It was beautifully composed with silky smoked salmon draped over greens, diced cucumbers, onions, and tomatoes, then sprinkled with capers and finished with a house dressing and four croutons arranged neatly at the edges. The brine-y flavor of capers is growing on me. 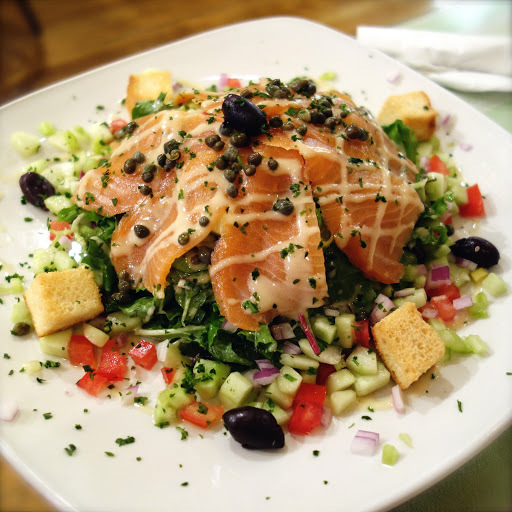 Smoked salmon salad with cucumbers, onions, tomatoes, capers, croutons, and a house dressing. Friday, October 5, 2012. I began my third visit with a hot chocolate topped with whipped cream. (We discussed nutrition earlier. It isn’t my thing.) The day was warm and sunny and yes, I endured mocking for ordering hot chocolate in short-sleeve weather. Remind me to tell you about the time I bought a winter jacket in August. But I stand by this decision, and the flavor was rewarding. It’s hard to go wrong with hot chocolate. Now for the star of my meal! Let’s begin with what’s important, which is that goat cheese is one of my favorite ingredients on this planet. Four out of five times, if a menu offers an item with goat cheese as one of its primary components, I will order it and love it. I had a fondness for goat cheese before I was ever “into” food. Goat cheese has made two appearances in my meals at Cafe Mangal so far: my pear-and-goat-cheese salad, and the goat cheese and vegetable sandwich. As long as they keep putting it into things, I’ll keep ordering them. 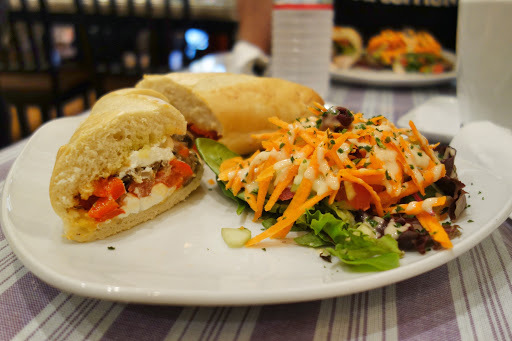 The goat cheese and vegetable sandwich ($11.25) consisted of a generous amount of warm-but-not-hot Vermont goat cheese, roasted eggplant, tomatoes, red peppers, olive oil, low-fat red wine dressing, and oregano on I-shall-devour-entire-loaves-of-this soft french bread. 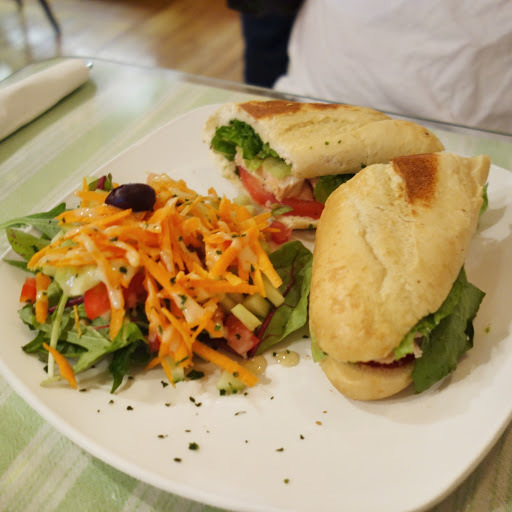 The sandwich was served with a side salad of greens, carrots, chopped cucumber pieces, tomatoes, and olives. Goat cheese-and-vegetable sandwich with goat cheese, roasted eggplant, tomatoes, red peppers, olive oil, oregano, and low-fat red wine dressing. The last time I had eaten eggplant was at the Market Restaurant in Gloucester, MA, and this reminded me how much I like it. The olive oil and red wine flavors were excellent complements to the goat cheese and vegetables. All in all, this sandwich was excellent. As much as I love to try new dishes when I return to restaurants because it adds variety to my blog, I might ignore variety and just order this again on my next visit to Cafe Mangal. 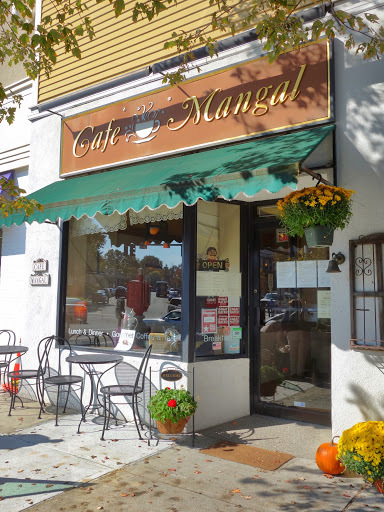 Cafe Mangal is an excellent lunch option for anyone looking for a healthy and delicious meal in the Wellesley area. I rarely eat salads but they are so fresh and so tasty at Cafe Mangal that I will eat them there and grudgingly live an extra decade. I hope your dining experiences there are as happy and healthy!